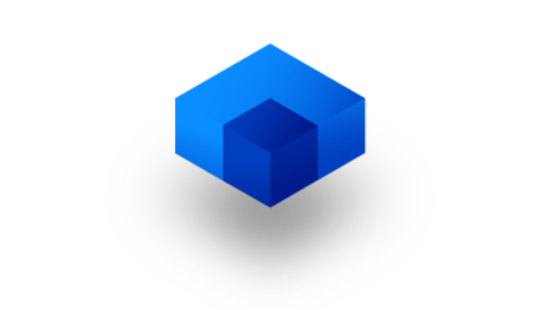 An online marketplace is one of the most profitable areas of modern business, and Airbnb, Amazon, and eBay prove it. Despite huge competition, an online marketplace is still a promising business idea. One of the most fascinating examples is Etsy, an ecommerce marketplace that deals in peer-to-peer (P2P) selling of handmade and vintage items. 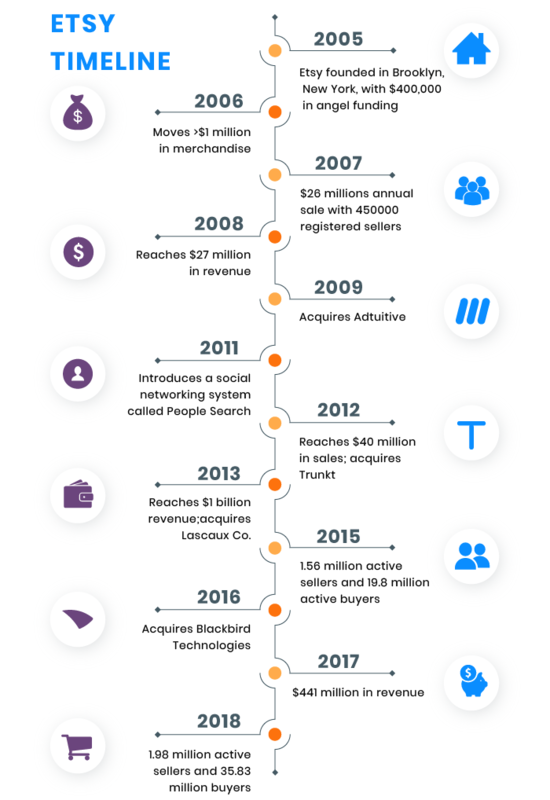 The infographic below shows the success of Etsy. Inspired by the success of Etsy? Keep reading to find out how to build a website like Etsy, learn how to create a product that the market really needs, and get marketing tips for making money with a website like Etsy. Before thinking about how to create an online marketplace like Etsy, let’s establish what this marketplace is like. Rob Kalin, Chris Maguire, and Haim Schoppik launched Etsy in 2005. Their goal was to enable crafters and vintage merchants to earn a living selling their goods. Etsy’s creators needed three months to launch the first version of the site, which later evolved into an online marketplace that allows people to sell and buy unique handcrafted products. Today, Etsy has more than 1.93 million active sellers and close to 33.4 million buyers, and the numbers keep growing. Just like any other online marketplace, Etsy allows people to buy and sell goods online. The concept is simple: sellers can open online storefronts and buyers can browse the website and buy items. It’s important to note that people can sell only handmade and vintage goods on Etsy. We recommend that you start development of a website like Etsy from a minimum viable product (MVP). Bringing your product to market quickly means you can get early feedback so you can fix issues or add features. Moreover, early feedback allows you to validate your product hypotheses and your value proposition as soon as possible and attract new users to your service. 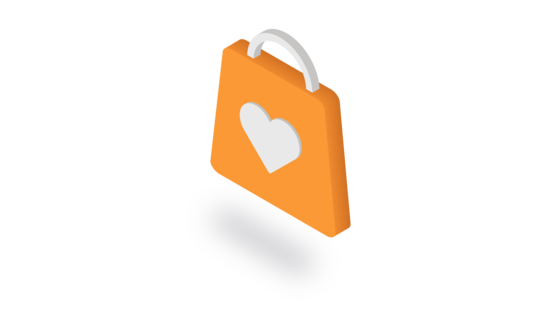 Let’s define the core functionality of a website like Etsy. What are the core features of Etsy? Etsy has three types of users: admins, sellers, and buyers. Let’s consider the core features these users require. 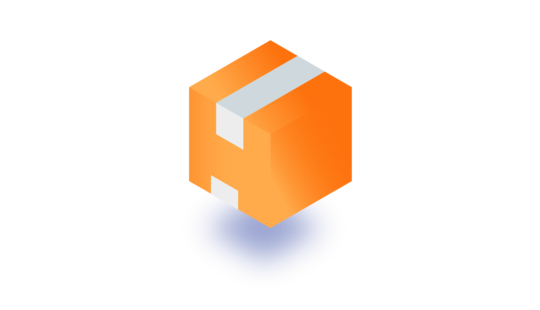 We’ve just listed the core features that are necessary for the MVP version of a website like Etsy. Now we’re ready to consider different ways to monetize a website like Etsy. How do websites like Etsy make money? Sales fees. On Etsy, sellers pay 5% of the purchase price in commission for every sale. Listing fees. Etsy charges sellers $0.20 to list one product on the website for four months. Order fees. Etsy charges sellers a flat fee for processing payments. This fee per sale depends on the location of the seller’s bank account. Here you can see a complete list of order fees per country. Advertising. Etsy provides sellers with two types of advertising: promoted listings and Google shopping. Promoted listings allow sellers to show their items in front of interested shoppers more frequently to get more visibility. Google shopping allows sellers to reach new buyers outside of Etsy. Etsy submits promoted listings to Google. The Business Model Canvas is a strategic management template that comes in handy for developing a business model and validating your startup idea. 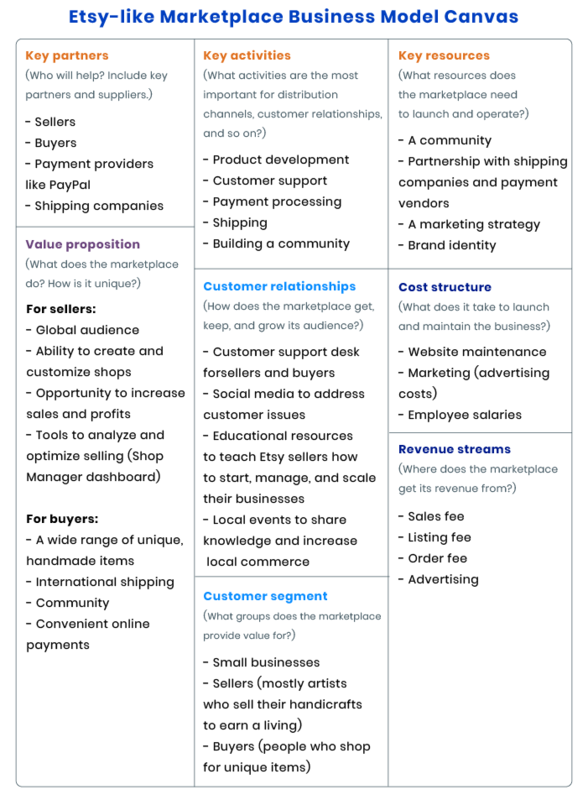 Let’s take a look at a Business Model Canvas for a marketplace like Etsy. This canvas breaks down the business model into easily understood components. What are the challenges of building an Etsy-like website? Let’s take a look at the challenges you may face while building a website like Etsy. Nowadays, to rank high in a competitive niche is a complex task, since there are global leaders like Alibaba and eBay. Every marketplace has its competitors – even Etsy. Recently, Amazon launched its own site for handcrafted goods called Amazon Handmade. Etsy had to face that challenge. How did the company deal with it? Etsy is a one-of-a-kind marketplace with handmade goods and delivers a completely different service from competitors. See for yourself. Etsy’s personal touches have made it a force in the ecommerce market. Etsy offers unique seller storefronts, a large product catalog with unique items, and local events to share knowledge and increase local commerce. All these help it to come out on top. Online marketplaces like Etsy that sell handmade and vintage goods can have problems with fake goods. If one seller copies the item of another seller, the original seller should report the counterfeit product. Etsy will take down listings of copied goods. When you run an online marketplace, you face the challenge of how to engage both buyers and sellers and make them come back. Etsy decided to play the role of matchmaker to make buyers and sellers come together. Etsy knew what items buyers were searching for and what search terms were driving traffic. So they decided to give hints to sellers about what to offer and share their data about demand. This satisfied sellers, since they now know what items are in demand and know what to produce to make more money. Buyers, in turn, get a large product catalog and know that everything they want will be available on the marketplace. How much does it cost to create a website like Etsy? 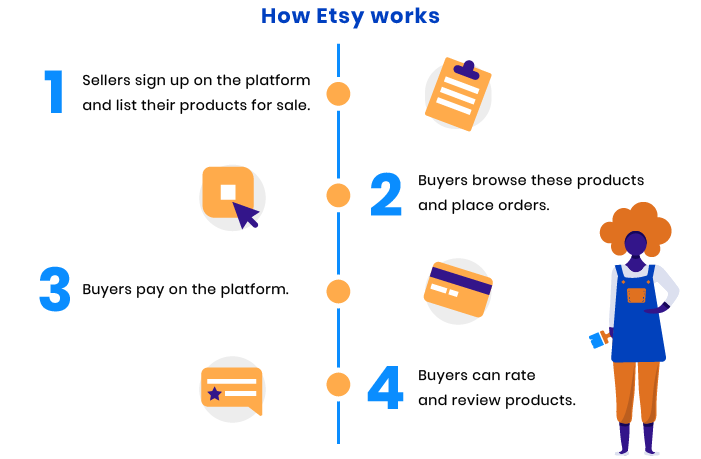 Given the information we’ve provided in this article, we can calculate the approximate cost of developing an online marketplace like Etsy. The cost of creating a website like Etsy is comprised of various factors – in particular, the number of features, the project complexity, and, of course, development company rates. 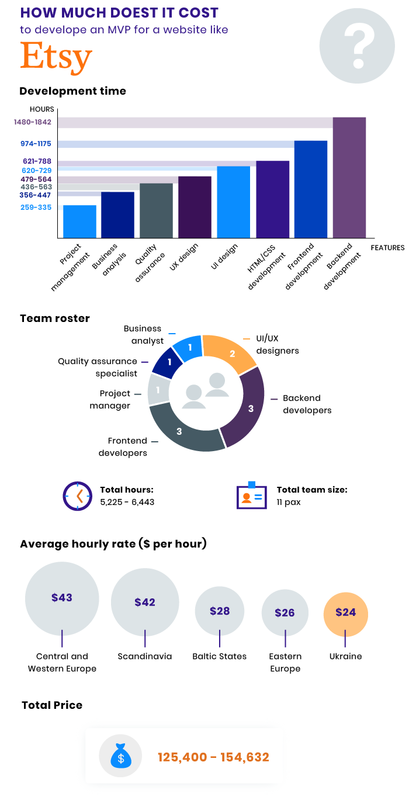 Below, we’ve calculated the cost for building an MVP of a marketplace like Etsy with the features mentioned above. If you have any questions or if you plan to create your own online marketplace like Etsy, don’t hesitate to contact us right now! Our experts will analyze your business idea and give you a more detailed estimate.